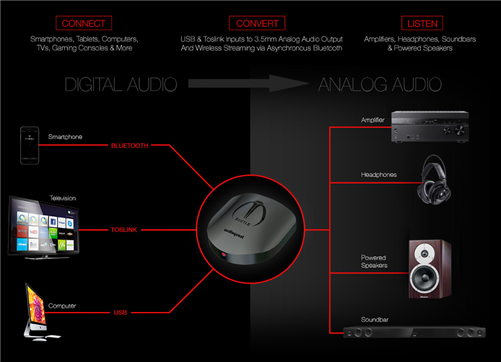 Beetle is a multi-purpose DAC for today's many different lifestyles. Capable of delivering naturally dynamic, uncompressed music via its high-performance optical or asynchronous USB inputs, Beetle adds exceptional convenience and surprisingly beautiful sound through its asynchronous Bluetooth technology. Some will see Beetle as the perfect complement to a TV's optical audio output-often the only audio output provided on a modern HDTV-while others will want to use it as a major sonic upgrade for their favorite media players or gaming consoles. Still others will take full advantage of Beetle's asynchronous USB input to enjoy clean, clear, naturally beautiful sound from any laptop or computer. But why choose one or the other? With Beetle's asynchronous Bluetooth technology, you can wirelessly stream music from your mobile device, while surfing the web, checking Facebook updates, or sending email. 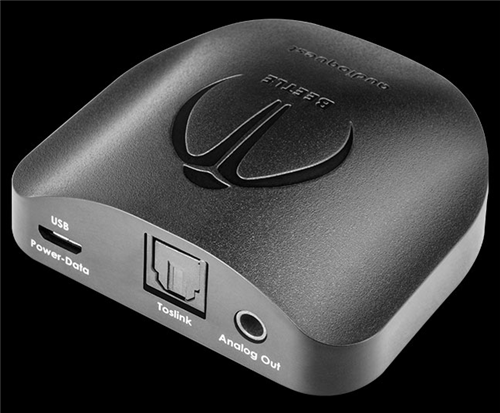 Now there are more great ways to enjoy the superior sound of an AudioQuest DAC!